And again my travel lead me to India!! The country I love so much... But at the same time sometimes hate. Where I find the best food in the world! REALLY!! If you go only for the food I think that is a good reason all by itself. But it is also the country where I took doggie bags and threw them out of the car into the hands of poor people alongside the road. 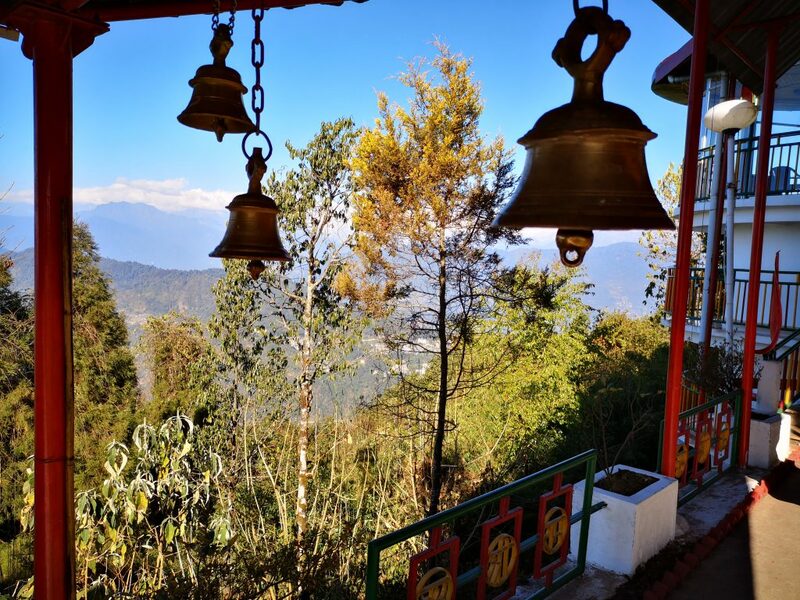 This time I go to explore Sikkim and I soon find out that Sikkim is different. There is not so much poverty as I am used to in India and it is a lot cleaner all around! 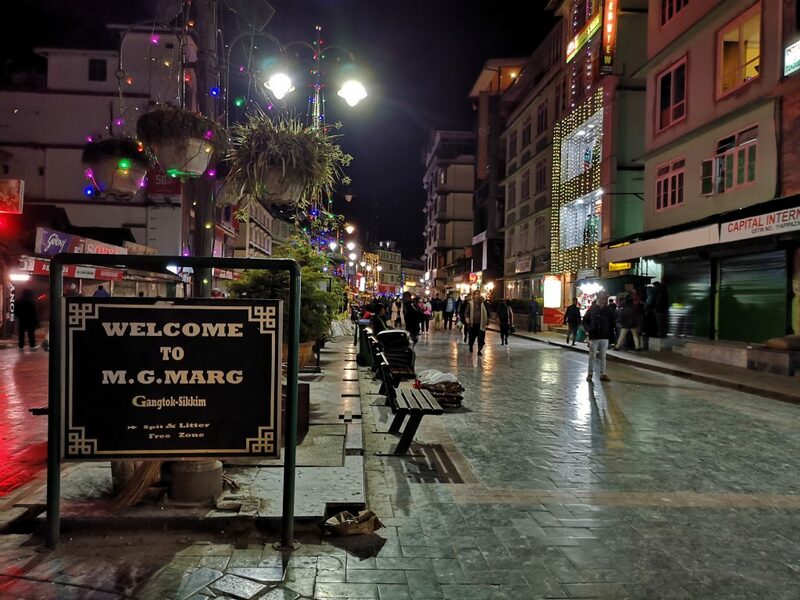 The first day we are in Gangtok and if we make an eveningstroll I don’t feel like being in India… It more feels like Indonesia or Malaysia. 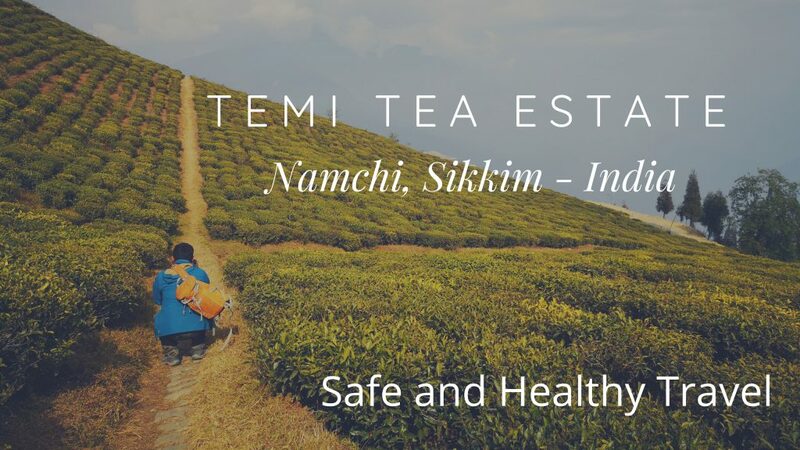 Sikkim is the state all the way up in India on the right side? It borders with China (Tibet) and Bhutan on the right and Nepal to the left of it. 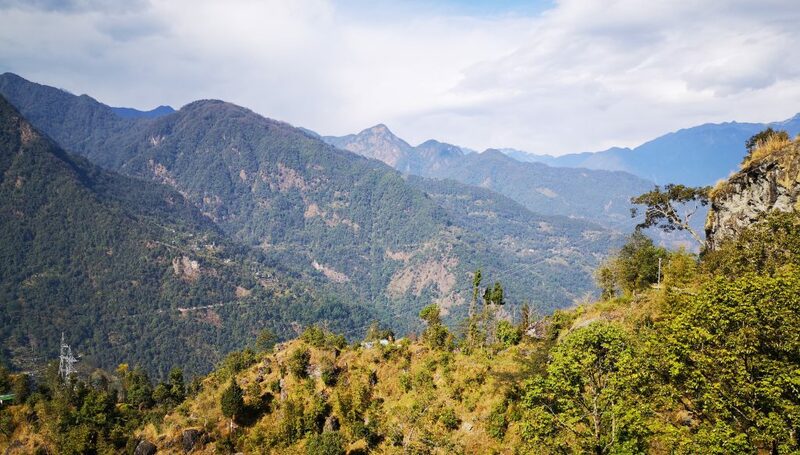 Sikkim is also in the Himalaya region so that gives it great mountains and views over landscape!! The state has the same Chief Mininster for decades already and that is the mainreason that it has been so stabile I’ve been told. The life is good. I heard there is a annual jobmarket, was in january this year. They make sure that every family at least has one job. This to maintain the income to be stabile in the different layers of society. that in almost the whole state plastic in banned? Also throwing garbage on the street is punished with a high fine. that in the city of Gangtok all kinds of religions are? I saw Buddhism, Hinduism and also Sikhs and Christianity. Our first day is full of history, culture and religion. 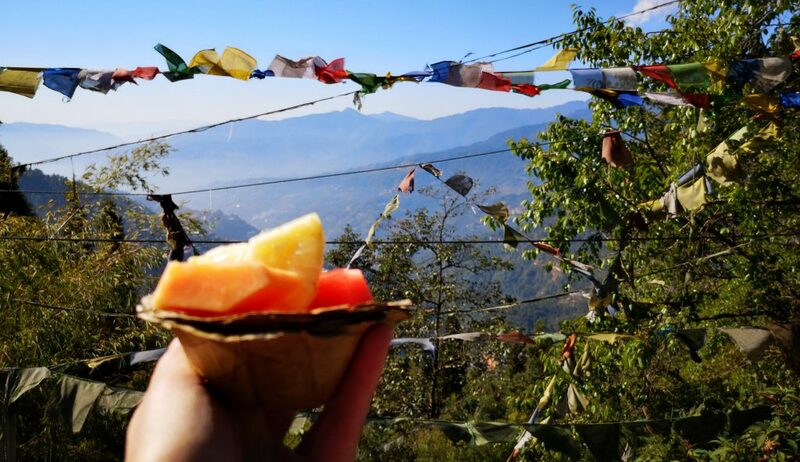 We went from temples to monasteries and on the way we are treated with the best of views!! On the one side of the road we find the best views and on the other side we see every now and then a waterfall. We sometimes stop for pictures ofcourse. Dro-dul Chorten, Rumtek monastery, Hanuman Tok, Gonjang monastery, Ganesh Tok, Enchey Gompa. At Hanuman Tok or Mandir we had that morning the best panorama view on the snow apped mountain called Kanchenjungha! This is the third highest mountain in the world with an elevation of 28.169 feet. This mountain is partly in Sikkim and partly in Nepal. 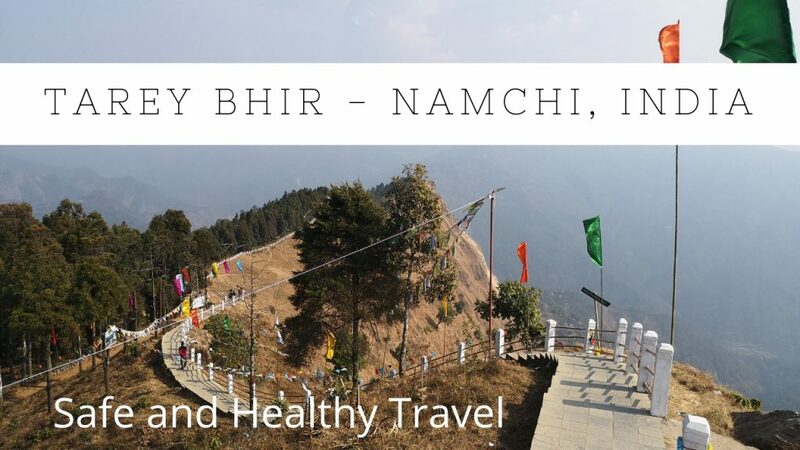 Later that day we also stop at Tashi Viewpoint for another great view! Do buy some great sweet fruit at a waterfall. If you look carefully you’ll see that the basket is made of organic leafs! I love that! At eveningtime you have to go to the famous shoppingstreet MG Marg. When you walk there you almost feel in Europe…as long as you don’t look at all the advertisment and sort of shops. The streets is so clean and nice!! You can get a great cup of chai there and ofcourse a good curry for dinner! On day 2 we leave Gangtok and start the 5 hour long journey through the mountains and along some of the best roads to Lachung in North Sikkim. 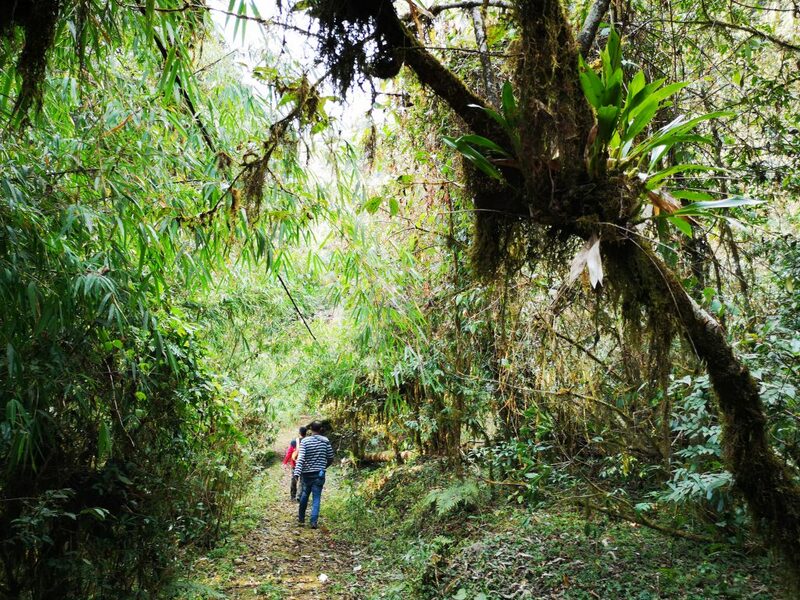 For hours we drive through forests that varies from pine trees, humongous ferns to metres high bamboo with trunks as thick as trees. 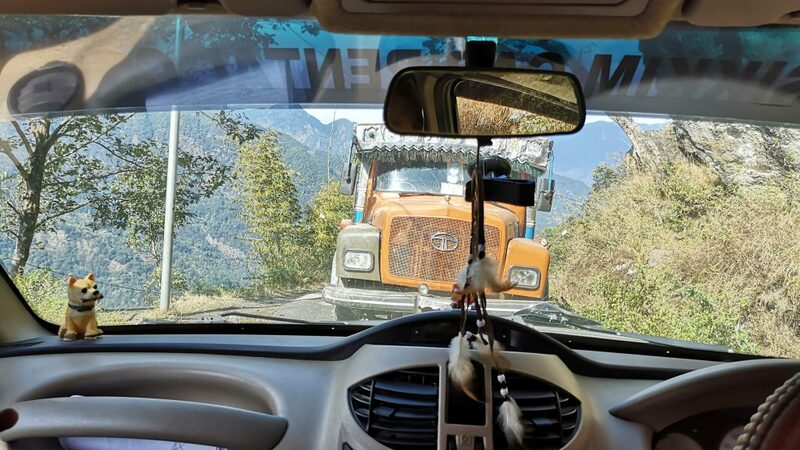 Because of several earthquakes in 2011 the road isn’t good in some places which makes the journey a real adventure!! Sometimes a big rock is on the road so you need to go around it or the road has collapsed and there is a bit of a detour created. Fixing all this is a huge job and that is not something that will be done in the near future. This view on Tsonga Valley is just the best!! The views you get along the way are just breathtaking! Huge mountains with little villages on the side. Along the road are some stops for us to enjoy the views and buy a 100ml carton cup of chai. Or how about the veggie momo’s? A kind of dumpling you can buy in the whole of Sikkim. With a little bit of hot sauce they are good for a great lunch! After about 5 hours we arried at cold Lachung at an altitude of around 9000 feet. It is around freezing point and it is even snowing a little bit. My Indian friends are really happy to see the snow, they don’t see it that often and in some parts of India it will never snow! On day 3 we went to the Valley of Flowers, als Yumthang Valley. We obviously don’t get to see that sea of flowers because you have to be here in march or april for that. In ancient times this route was an important one for merchandise to Tibet. Lachung was an important trading post on that route. Since Tibet has been occupied by China that is different. There are several army bases in this area to secure safety from China and other invaders. Before we enter the Yumthang Valley we need a permit. Well.. I need a permit as a foreigner and it was even a problem that I was the only foreigner in the group. You can’t go alone and you need to be in a group of at least two foreigners. So we were set up with 2 other Dutch travellers from the same company to accompany us that day. We were in two different cars and they had entered the valley before us but that was not bad. We got in after some explaining and could start our day into the Yumthang Valley. It had been snowing that night and so the road was closed. At the end of where we could drive we decided to go walking. We were walking in between the huge mountains that almost all of them were snow capped. It is cold and we are very happy to buy some chai along the way. You could also buy some snacks like a boiled egg or chickpeas with hot spices. After this we walk to the river Teesta that has been more then halved in size. We enjoy this for a long time, the soothing souns of the water and the wideness of the view. 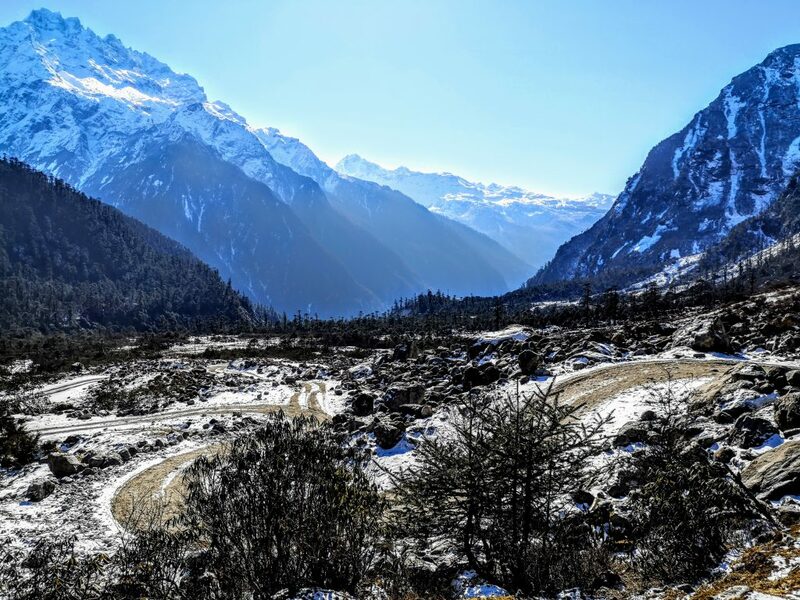 After a while it appears that the road has been opened and we can go to the Yumthang valley after all. When we get there we find it not to be as pleasant and beautiful as the first valley where we spend so much time. You need to come here in March or April when it is a sea of flowers!! We had a small lunch at one of the many touristic shops here. After asking everywhere what they serve it seemed all to be the same: Maggi noodles or bread with fried egg. With a great cup of chai it was good! 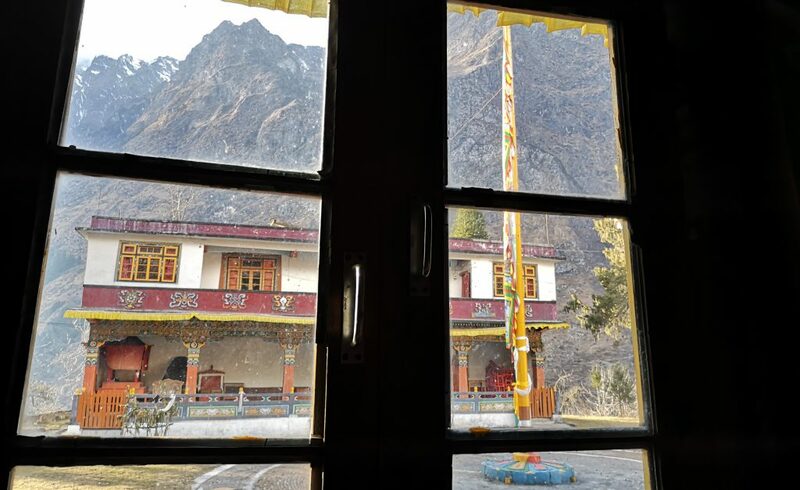 Back in Lachung we still had time to visit the oldest monastery of Lachung. This monastery dates from 1880 and the spot, high above the city, is a great one! We were lucky that when we were there the monk just came to offer and pray and so opening the door to us too. The way back we did by foot. 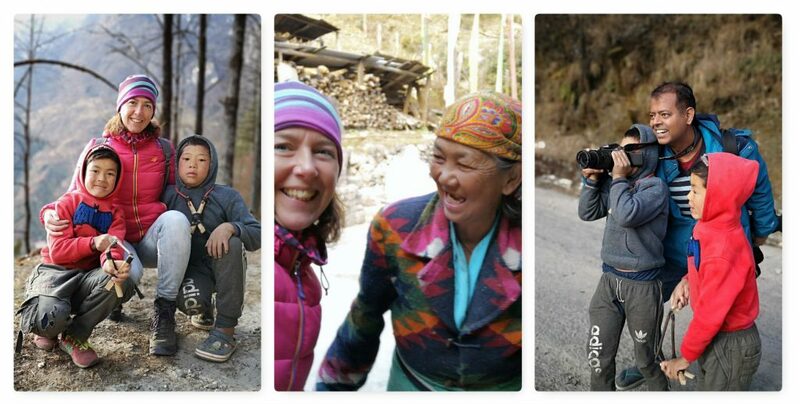 It was a great hike through the village and we had some great encounters with the local community. I do get, as a Western tourist a lot of attention. My fellow blogger and traveler Abhinav was so surprised by that. Lots of people were smiling and saying hi to us. Some even dare to ask me where I was from, sometimes Abhinav will also answer but they weren’t even listening anymore. We really had to laugh about those situations and the interaction got even better because of that!! 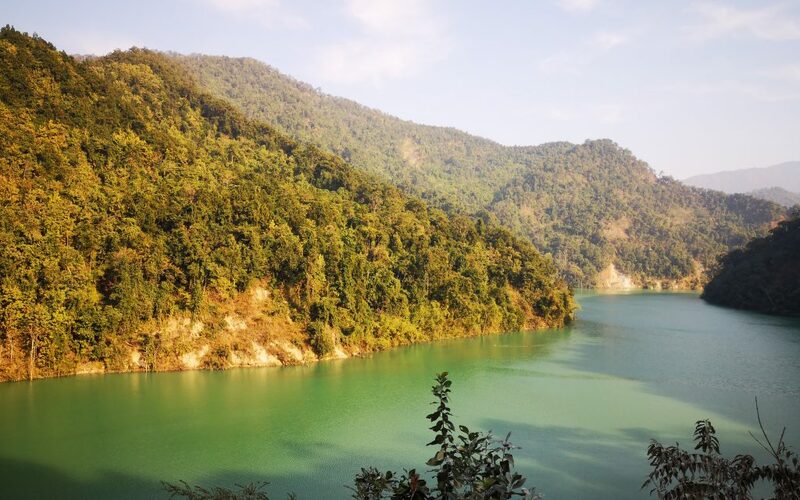 On day 4 we left North Sikkim and started on the 5 hrs journey back to Gangtok with some great stops along the way to enjoy the beautiful blue river Teesta from above! Situations that seem to be insolvable, on narrow roads with vehicles that are to wide are being solved with a smile and a wave out of the window of the car. This evening we met Yogesh of Sikkim Cab Rental, we have our diner at Parivar on the famous MG Marg. 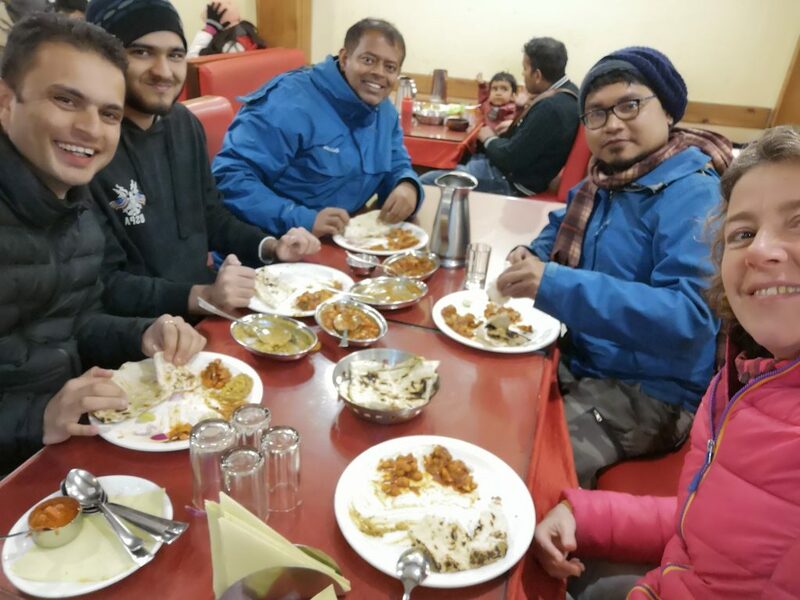 Yogesh invited us, Abhinav and Jitaditya, to explore this great state of India and ofcourse to share it with you! Yogesh has the company Sikkim Cab Rental Co and arranged a car with driver for us to use. Left to right: Yogesh, Backpacker Lokin, Abhinav, Jitaditya and I. After this visit we went on to Char Dham Parc. It is a pilgrimage for lots of Hindus, there are lots of recreated temples that you can find in the rest of India. And in the end there is a humongous Shiva statue. We also went to Samdruptse. A huge Buddha statue near the Ropeway of Namchi. This ropeway is a must with clear weather!! 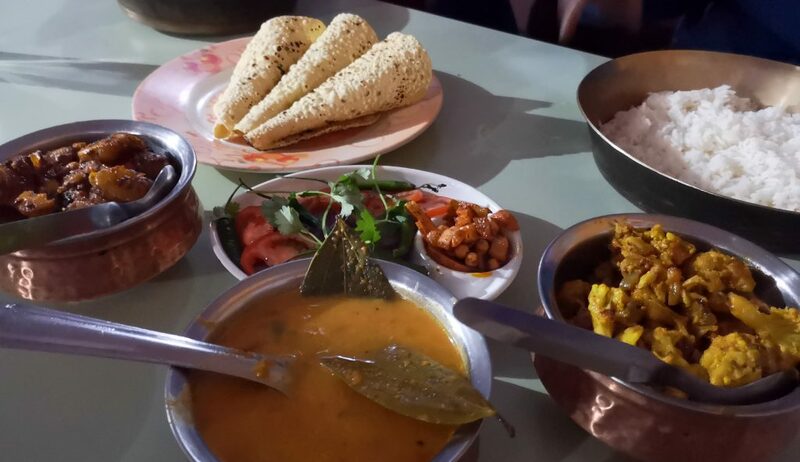 We stayed at Luitel Residency, it is located across the street of the wonderful Sai Mandir just outside Namchi. The hotel is half way up a small hill and so you have a great view. The hostel and hotel has a great terrace / garden where you can enjoy a BBQ while you relax after a day exploring! We really enjoyed our food there!! And if you like a bonfire in the evening.. They’ve got the perfect spot for that. There is no central heating in India so it can be cold in the evening. But with a great bonfire and it is offered almost everywhere for 500 to 1000 INR (you share the costs ofcourse) you can warm yourselves and have a good talk about the day before heading to your room..
Day 6 we start around 10 at the Temi Tea Estate.The sun has come through and that gives the plantation just that little bit of extra colour green. I loved the walk over these grounds, enjoying the views and the sun. Afterwards we went into the shop to buy some tea and ofcourse a cup of chai!! We went on to Damthang to go for a hike on Tendong Hill. The weather was great, so much nicer and warmer then we were used to these last couple of days. We started the trek in the middle of this small village, just next to the local shop there is this stairs to go up this trek. The hike is around 7K and it took us around 3 hrs to go up and down. When we got up there we were pleasantly surprised to find a Gumpa, a religious site! A great active afternoon after a couple of days mostly in the car and hardly any activity for the body! As you can see…. I needed that!! We also went into the centre of the city of Namchi. There is a nice Central Park, it was given to the citizins of the city by Namchi Municipal Council after the 2011 earthquake. Lots of shops and some local fast-food shops. We had a great veggi Samosa. 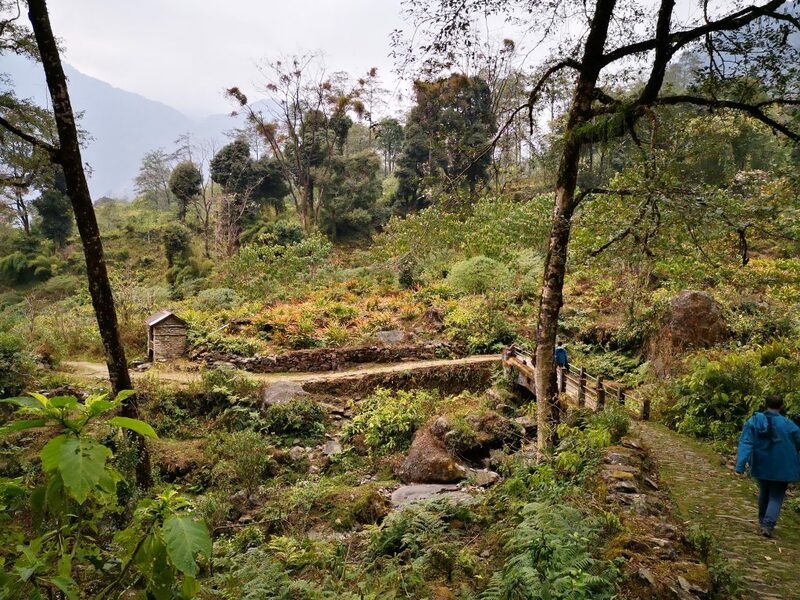 On day 8 we go on to Pelling, West Sikkim. 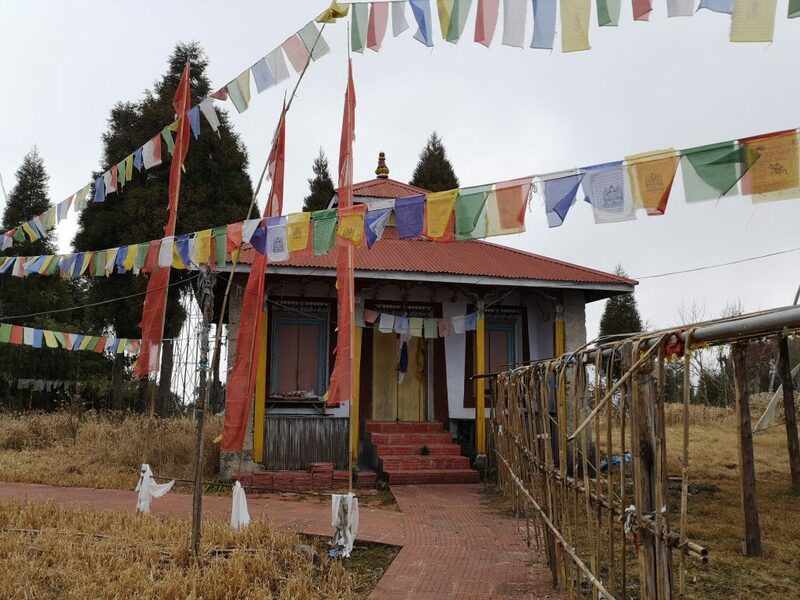 Just outside of Namchi we visit the impressive temple complex of Dechhem Chhyoling Gumpa (Dechhem Chhyoling Gumpa) where they are working hard on making a cremation area. There is also a school on the premises. We also went to the huge Buddha Park in Ravangla that afternoon. I really loved walking there, the serene chant of Om Mani Padme Hum was played softly throughout the parc. I could’ve stayed for longer and sit down to meditate…. As you can see it was not that busy at the time we were there. 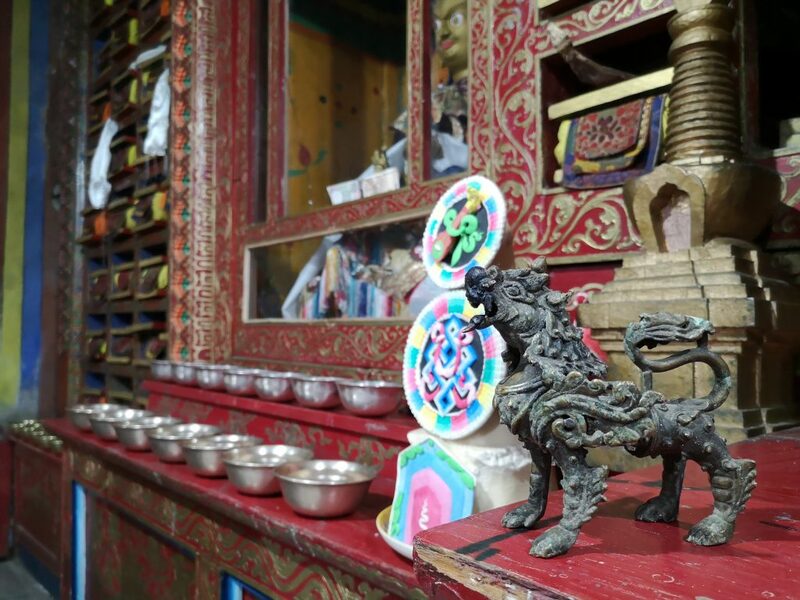 When you walk to the toilets and go on to the gate you can enter to visit the monastery: Rabong Gompa. We almost missed this one, there are not many signs to tell you. So think about it when you visit, it is defenitely worth it! We went to the ancient old city of Rabdentse, also known as the Machu Picchu of India. These ruins shows you the palace of long gone times. 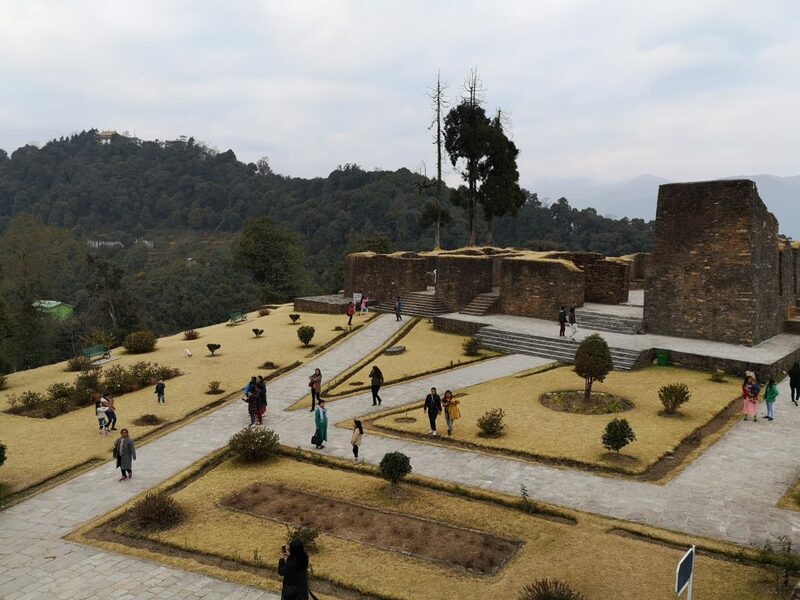 The palace is situated on a hill and and a nice trek will bring you there! 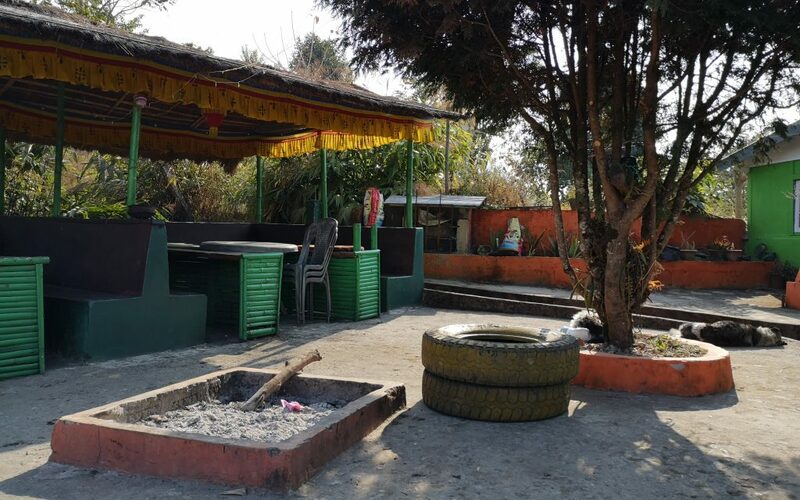 Unfortunately they have made a birdwatching sanctuary where they captured the birds and put them into cages..
Chenrezig is the embodiment of compassion of all the Buddhas. This place is because of that also an important pilgrimage for Hindus. 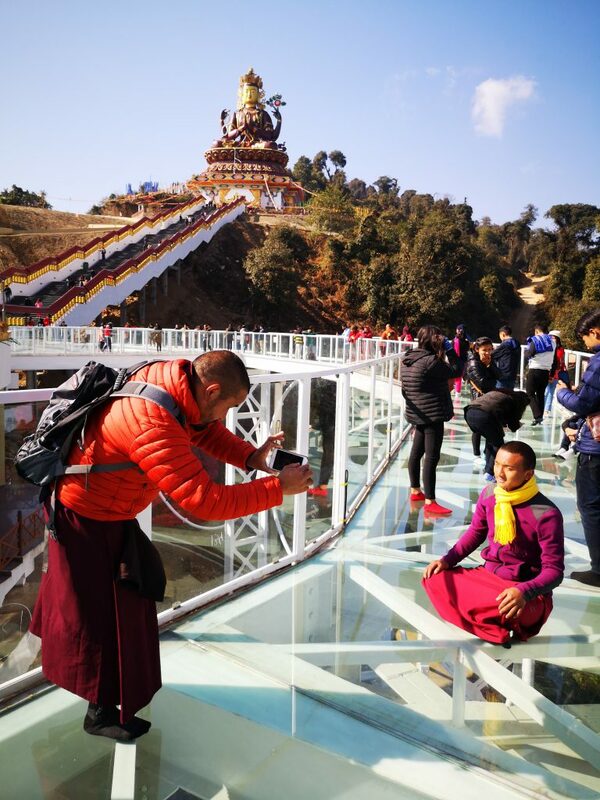 Next to this statue and Skywalk there is also the beautiful Sanga Choeling monastery with a great view to the other side of the hill. Don’t forget to walk pass this one on your way down! That afternoon we visited the second highest brigde in India, the Singshore brigde. 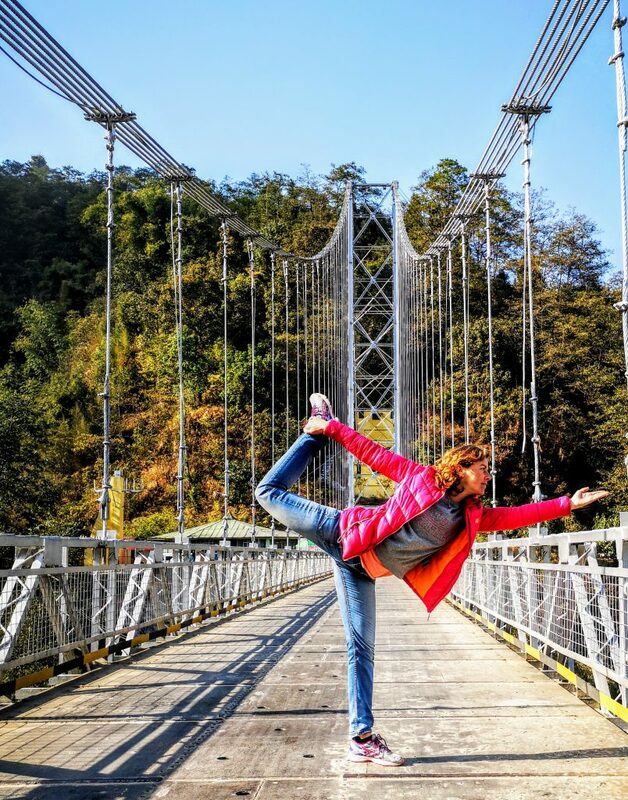 The brigde is over 100 meter high and has a length of 240 meter and is the longest and highest of Sikkim! On day 9 we went to Yuksom. On our last day of this great tour.. On our way there we visit a biological garden with orange trees. When we entered Yuksom it immediatly felt like a great and peacefull place. We were staying in Pelling which has no real identity but only over 250 hotels. We felt sad we didn’t stay here. 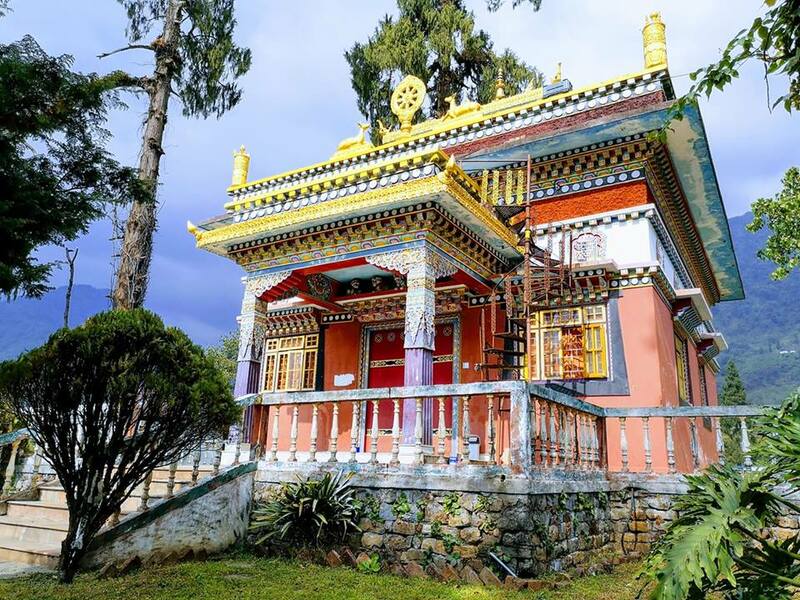 So if you can choose your stay for West Sikkim….Go to Yuksom and book your stay here. It is an old village with lots of nice, local streetfood restaurants and the best temples!! 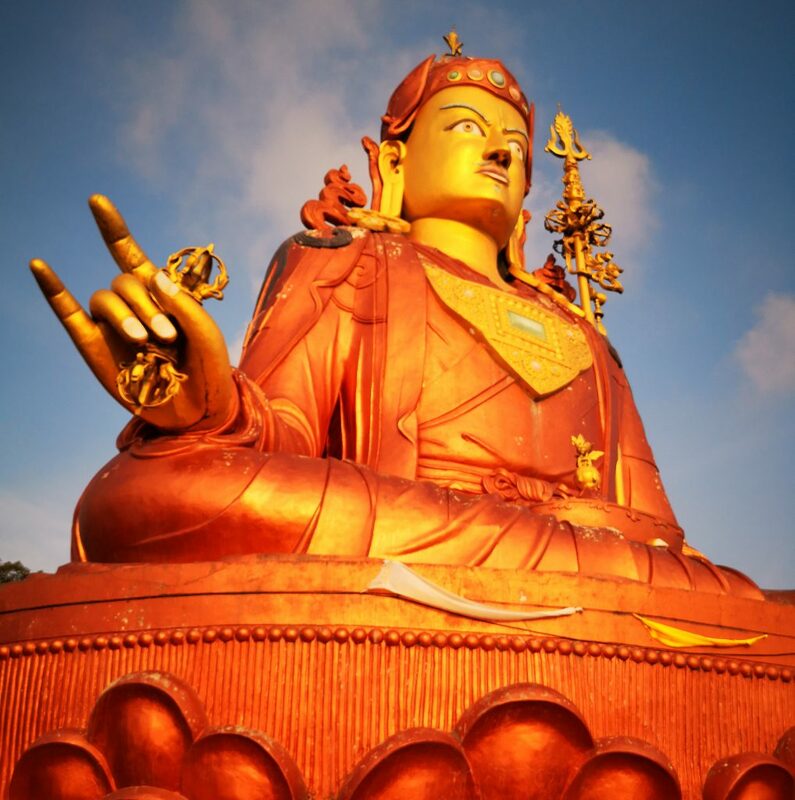 We hiked to Norbugang, to see Coronation Throne where the first religious king (Chogyal) of Sikkim was crowned. 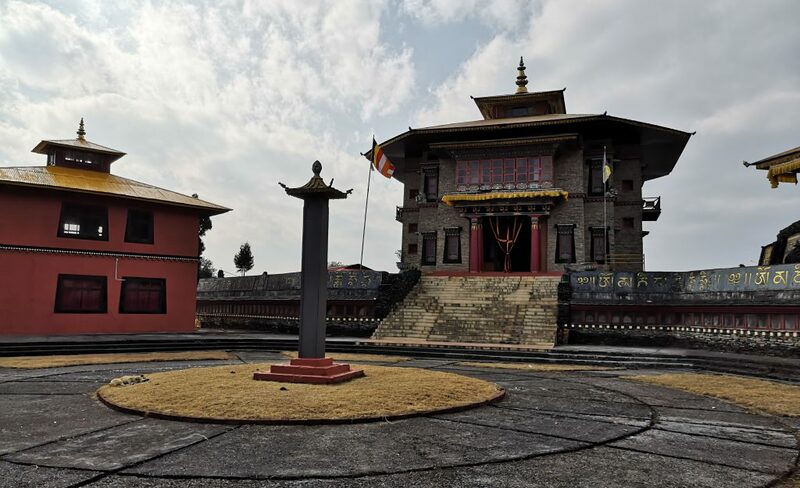 This is also the place where the 3 lama’s preached their religion, Buddhism. Hiking back to the centre of Yuksom we visited the wonderful Kartok monastery. After a short break for lunch we hiked up to the Dubdi Monastery. It is a hike of around 3 K from the centre. When we got there it was closed but we met a Canadian that did a hike further up and he recommended us to go there too. It was a great hike and so full of Buddhism influences because of the many flags and at then end some tree overgrown ancient old stupas. I really liked this part!! That last day we drive to Bagdogra in West Bengal. My flight was planned from here to go to Delhi again. From there I would go on to Amsterdam, The Netherlands after a day exploring Delhi and visiting a friend  On our way back to Bagdogra we stopped at Coronation Brigde. 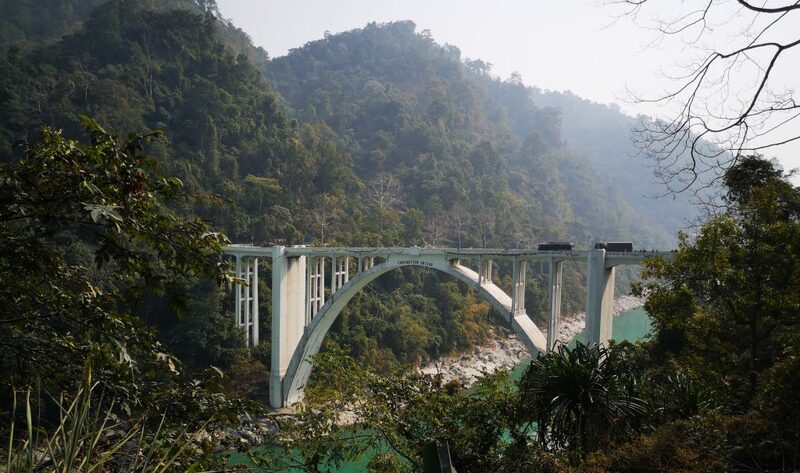 It gives you a great view once again over that blue river Teesta and gives you time to buy some fresh fruit with red pepper for 20INR. Would you love to book this trip too? 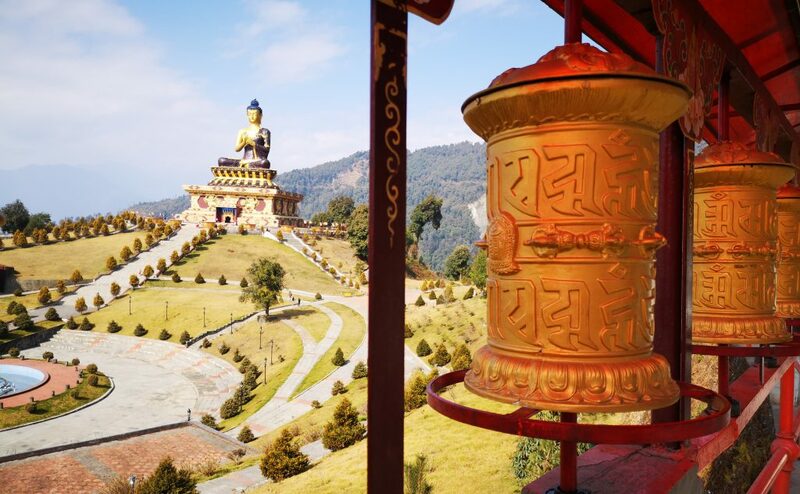 Contact me or go directly to Yogesh of Sikkim Cab Rental Co. We love to help you exploring the great state of Sikkim!! I was in North, West and South Sikkim. 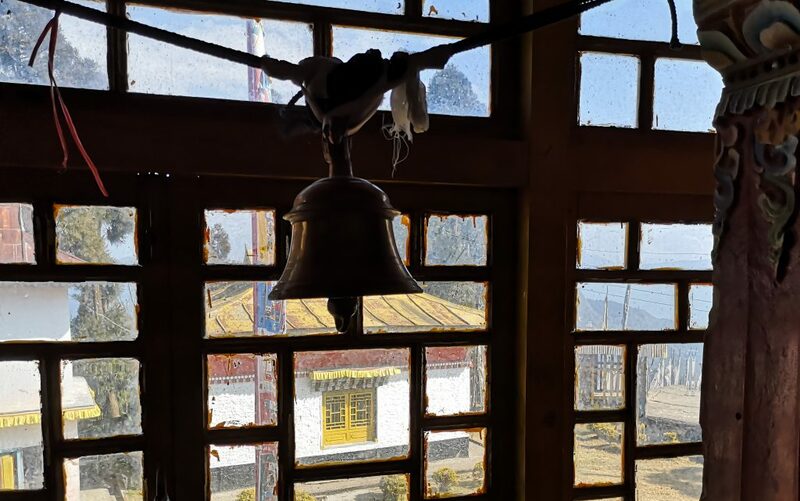 I stayed in 4 different places: Gangtok, Lachung, Namchi and Pelling. I visited 13 monasteries which I loved for their history and for their views over the surroundings!! I paid for a meal, lunch or diner around Voor een gemiddelde maaltijd, lunch of diner, betaalde ik rond de 1 tot almost 4 dollar. 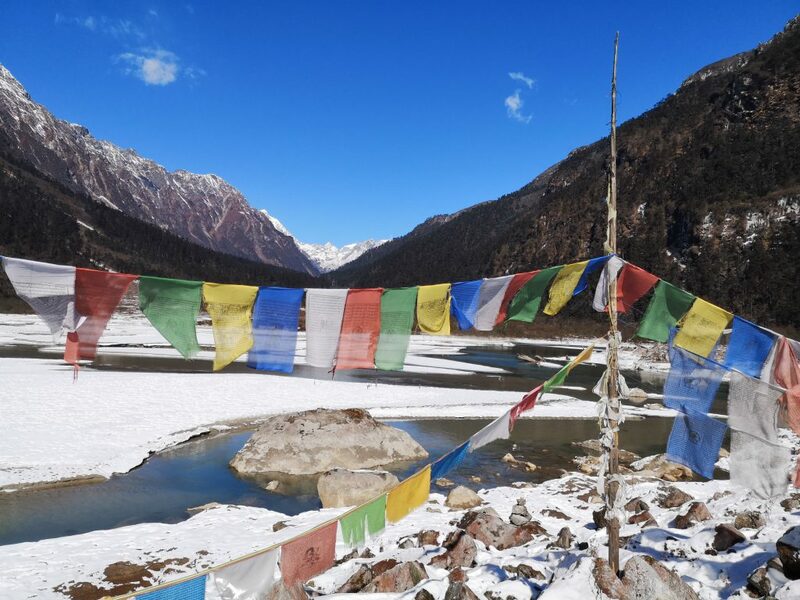 To visit Sikkim you need a permit. When you enter Sikkim you go to a agency and they need a passport picture, a copy of your passport and a copy of your visa for India. 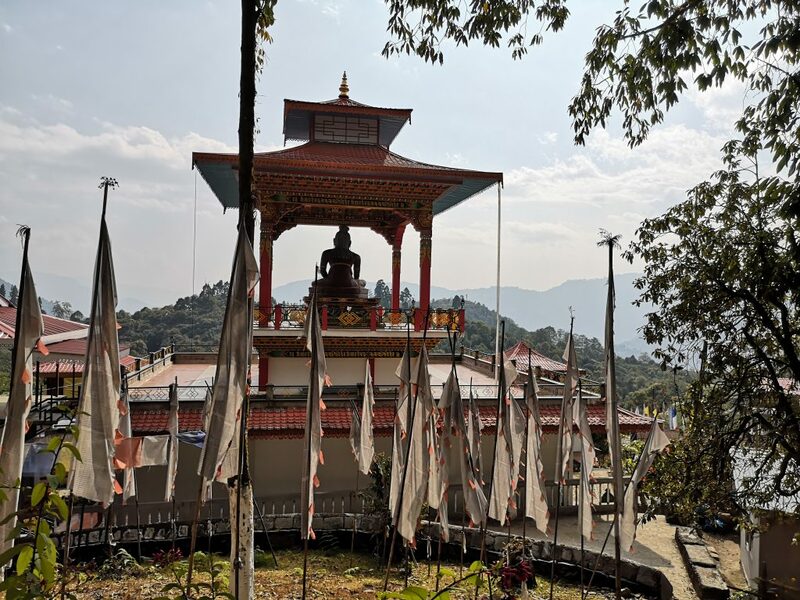 In some parts of Sikkim you can’t go as a solo traveler and you need foreign company, 2 or more foreigners was enough. This was needed in Lachung. Be aware of the fact that your in the Himalayas. You’re at an altitude between 5000 to 9000 feet and the hotels and restaurants haven’t got heatings. So good jacket, sweater and some thermo clothes are a good thing to carry with you! You can use the ATM in the city I have mentioned. I changed 100 Euro and it was enough for me to have lunches, pay for entrees and buy some small items along the way. Only on the last day when I started buying some souvenirs I needed more money. The shower has limited hot water. There is a boiler in the bathroom that you need to activate 10 minutes before showering. Mixing the hot and cold water is also a bit tricky. Sometimes it does not really work and it is either hot or cold. India is mostly vegetarian. If you look at the restaurant menus you’ll see mostly vegetarian or even vegan. All the products you’ll buy will have a logo to show you if its vegetarian or vegan also. I really like that about India. Check products for a green dot or a brownish/orange dot (includes egg). Do you like this trip too? 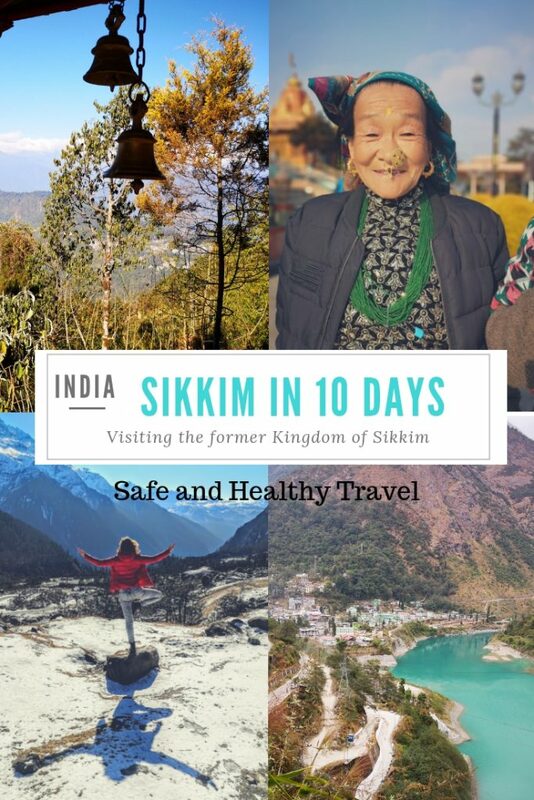 My bubble on the net is not that big yet ..
Will you help spread the word about Sikkim? Looking for more travels in India? I hope you love this world as much as I do!! 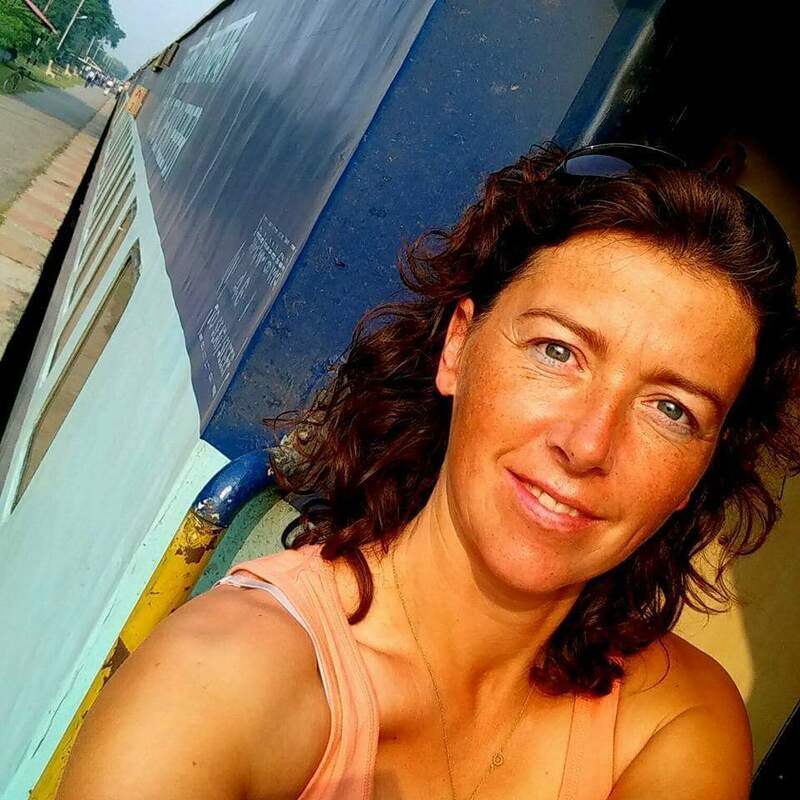 Jacomijn is a police officer from The Netherlands who loves to show you how to travel the world Safe, Healthy and Active!! 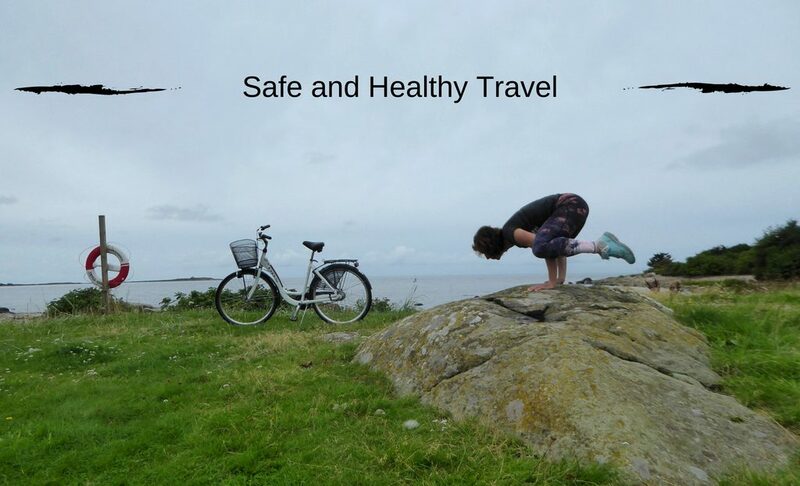 Safe and Healthy Travel is a MUST! Great place to be in. Very few lucky ones get a chance to visit these. Will love to visit these if given a chance. Thanks for sharing this great post. Thank you very much!! 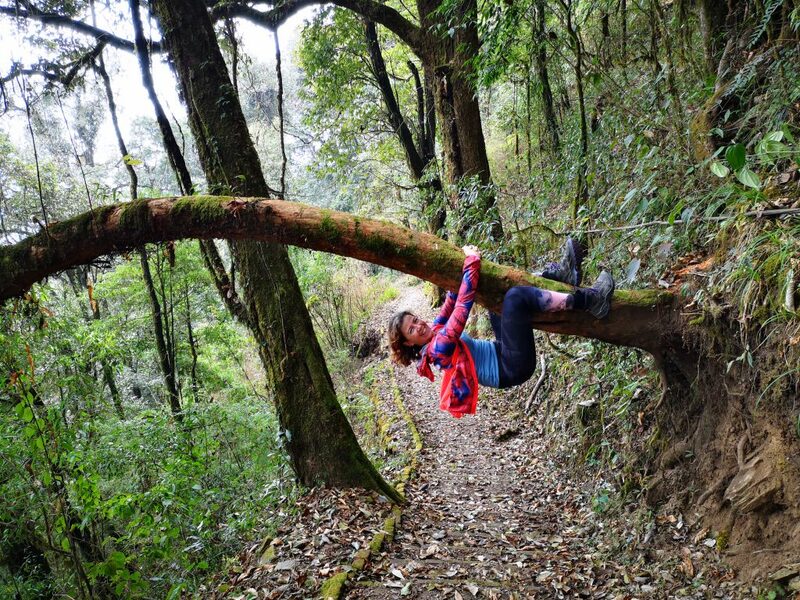 I loved Sikkim! !